Rated 5 out of 5 by pennmom36 from Hero Has A Brand New Adventure! While traveling the world in a hot air balloon, Hero crashed into the island of Tapa-tui, where he met and married, Bright Light the Chieftain's beautiful daughter. Hero's adventures continued when he himself became the Chieftain of Tapa-tui after the death of Bright Lights father. 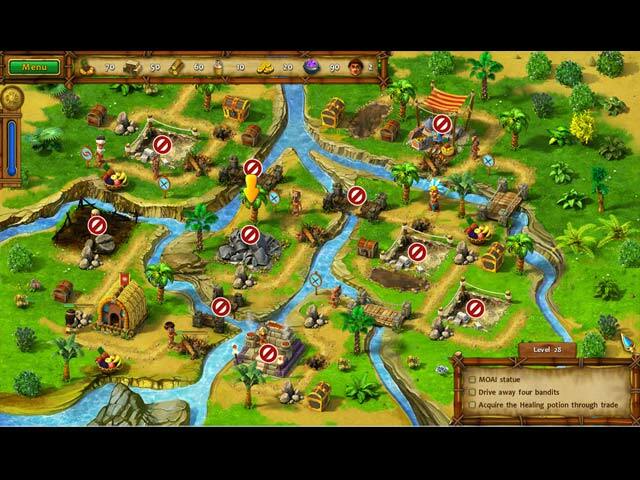 Tapa-tui is a peaceful and tranquil village, but Hero must establish trade with the nearby territory of Mata-fiki, in order to keep up with the resource demands of his people. 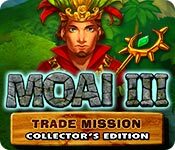 I love the Moai series, the graphics are exceptional (for a TM game of course) the tasks are clear and obtainable, and there's always a nice variety of features, however, I don't see the need to present a Time Management game as a Collector's Edition. The only feature even remotely beneficial would be the built in Strategy Guide, but it's very difficult to get "stuck" on a TM level, after all you can replay any level as often as you want, so to me, it's really a waste of money unless you've just gotta have a few wallpapers and a few extra levels. (100 levels total throughout the game. That's just my opinion, but personally, I'll wait for the Standard Edition to be released to purchase. There are two modes of difficulty available, Easy mode which is untimed for a relaxing experience the other is Casual which is designed for gamers familiar with TM games. There are a whopping 56 Achievements to earn, including the Tikku-ana Locket which is activated when you complete every level with a gold medal. Each level has tresure chests available which contain valuable artifacts and bonuses such as the Sandals of Speed which give the moai a little more speed to get the job done. There are 24 different Artifacts to earn that increase resources by a specific percentage. The Artifacts are kept in your backpack and you can choose a handful to apply before each level if you choose. This Collector's Edition has 4 Wallpapers (which are cartoonish in style) 9 Music Soundtracks, 14 Character Biographies, Bonus Levels, and a built in Strategy Guide, enjoy! 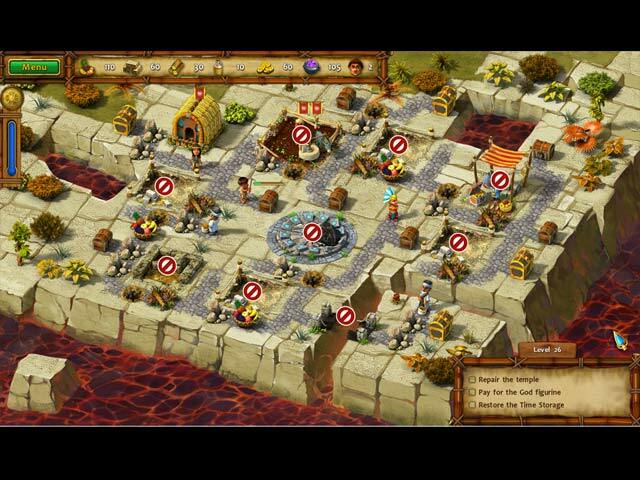 Rated 5 out of 5 by beezelbom from Another Great Moai Game! Another great Moai game, with the added bonus this time of different skill levels. You can play on casual with a timer, or easy with no timer. I personally am so glad of the easy level I love the games but can not get gold except on early levels. In Moai II, I just ignored the timer when I reached the point where I was completely unable to get gold. I love the game but I like to play at a much more relaxed pace, so this is working out wonderfully. I know many players crave the challenge of a timer so my best wishes to you, I believe you will love this game, I highly recommend it. Rated 4 out of 5 by TooOld2Play from Length 5 stars, Challenge 3 My review is based on the fact that I have the other games in the series. Rating Moai III is difficult. The length is definitely 5 stars with 100 levels to play (and yes the great contributors on the BF forum helped me figure THAT out) but I found the level of difficulty not all that hard in comparison to earlier versions of the game. Overall you will find this similar to the others but enjoyable. There are some games that are impossible, this one is not. I assume the SE will have less levels. Rated 4 out of 5 by boogienites from Oh how I wish I could give it 5 stars!!! 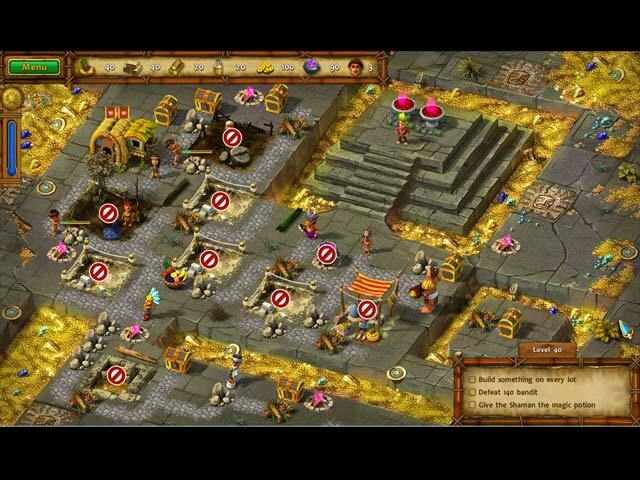 I absolutely love strategy/time management games, so I was delighted to see this game on BFG! I have the previous 2 games and both challenged me while giving me hours of pleasurable playing time. I so wanted to be able to give this 5 stars, but I have to be honest (sure wish I could give 4-3/4 stars). First, I will say it is worth the CE price because there are 100 levels to play. The only reason I didn't give it a full 5 stars is that as the game progressed, it was not as challenging as I thought a 5 star game should be. There were a few levels that I had to replay several times in order to beat the clock, but for the most part, I had plenty of time left over. Definitely not as challenging as Incredible Dracula by a long shot, but it was fun to play. Having been one who tested software before release, I can only imagine the amount of time and effort it takes to create TM/strategy games (think about it people; they have to make sure that every single click results in the desired results w/out crashing the software; they develop awesome graphics (watch the moving water, birds flying, etc. on these games), and this developer is one of the best!) That said, I would recommend this game. Wasn't crazy about the story line, but anytime BFG gives us a decent time management/strategy game, I'm in. Thank you BFG! Rated 3 out of 5 by pd2324 from Game is outdated I found this game to be under the high standard of big fish games. Rated 3 out of 5 by ElizabethR1533 from It's okay It's okay. But how can the CE price be justified? I enjoyed my free hour, and waited a few days for the "regular" version to come out, but it hasn't, and there was an offer on, so I bought it. I don't know why. The game is okay, another standard TM game, but twice the price. It's just the usual build this and collect that situation. The graphics are quite good, but the "dung, dung" when the garden/sawmill/whatever, needs water/sun, is annoying, as it's often one after the other after another, and lends zero to the game. TBH, I don't know why I even bought it with the offer. It's another lazy TM game, like most others seem to be. Boring and repetitive. Sadly, the very few TM games we get seem to be like this. Rated 2 out of 5 by pmmarti from game doesn't load at level 35, slow moving I was quite surprised at the slowness of the characters moving to and from the tasks. I have a black screen at level 35 even going back under a different character name. There is little challenge here. Least favorite game I have purchased. Rated 2 out of 5 by jmidge0217 from Bored I must admit that I am not very good at these games-I keep trying them -but usually get frustrated after 8-10 levels when I just can't finish them in time. I guess as an older player I am just not quick enough on the controls to succeed. With this game I was surprised to find myself bored by level 3-wondering why I was bothering-so I quit & uninstalled. I have tried the earlier games in this series & did not have the same experience-frustrated yes-bored no. I would suggest doing the demo instead of buying it outright based on the previous games.